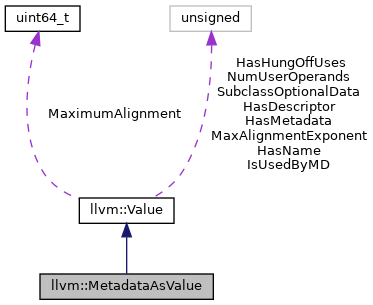 A member of the Value hierarchy to represent a reference to metadata. This allows, e.g., instrinsics to have metadata as operands. Notably, this is the only thing in either hierarchy that is allowed to reference LocalAsMetadata. Definition at line 173 of file Metadata.h. Definition at line 67 of file Metadata.cpp. Definition at line 192 of file Metadata.h. Definition at line 105 of file Metadata.cpp. References canonicalizeMetadataForValue(), llvm::Type::getMetadataTy(), llvm::LLVMContextImpl::MetadataAsValues, and llvm::LLVMContext::pImpl. Referenced by llvm::formLCSSAForInstructions(), FunctionNumber(), getDbgIntrinsicValueImpl(), getDeclareIntrin(), getMDNodeOperandImpl(), llvm::insertDebugValuesForPHIs(), LLVMGetCurrentDebugLocation(), LLVMGetMetadata(), LLVMGetNamedMetadataOperands(), LLVMMDNodeInContext(), LLVMMDStringInContext(), LLVMMetadataAsValue(), operator<<(), readTriple(), llvm::remapInstruction(), llvm::replaceDbgUsesWithUndef(), rewriteDebugUsers(), RewriteUsesOfClonedInstructions(), llvm::salvageDebugInfoForDbgValues(), truncateIVUse(), TryToSinkInstruction(), llvm::InstCombiner::visitCallInst(), and wrapValueInMetadata(). Definition at line 113 of file Metadata.cpp. References assert(), canonicalizeMetadataForValue(), llvm::LLVMContextImpl::MetadataAsValues, llvm::LLVMContext::pImpl, llvm::Ref, llvm::SPII::Store, llvm::MetadataTracking::track(), and llvm::MetadataTracking::untrack(). Referenced by llvm::FindDbgAddrUses(), llvm::findDbgUsers(), llvm::findDbgValues(), mergeInlinedArrayAllocas(), and llvm::replaceDbgValueForAlloca(). Definition at line 190 of file Metadata.h. Referenced by extractMDNode(), and forEachUser(). Definition at line 175 of file Metadata.h. Definition at line 174 of file Metadata.h.